dont stay if you are sisters ar friends as your accused of being lesbians ! Our room was in a terrible state with holes in the wall, ceiling flaking in, all woodwork carved with names. 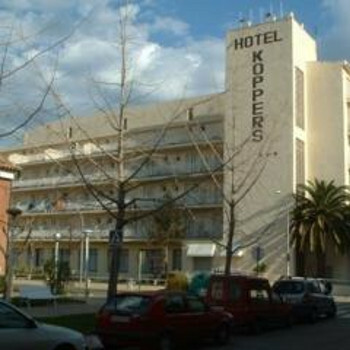 I chose Hotel Koppers for the "quiet" location but this took quiet to the limit. Entertainment which is supposed to keep you in the hotel was non existent as those booked disappeared as quickly as they arrived. We often went to the Stella. The hotel itself was in a bit of a state, my balcony had a crack running through the middle of it and we were on the top floor...scary. I was lucky enough to have the vent from the kitchen extractor fan outside my door, the smell of fat in the morning is not very appealing...believe me! There were no fights for sun beds as you nearly killed yourself climbing into the pool due to the steps hanging off the sides. Our room was dirty and needed a good clean but compared to our neighbours who had bits of wall missing we were lucky. Most of the staff was ok but the barman did cause a bit of upset with our children. The food, well I and others spent more money eating out than anticipated as it was quite clear that it was regularly from a previous mealtime but covered in a sauce. The bathroom was clean, fresh towels every day. However, the bed room was dirty and very dusty and there was a hole in the wall with plaster falling out. Food was chips every day with salad and various meat and fish dishes some of which looked very similar the next day, however no tummy upsets so must have been stored correctly. There was a lot of pushing and shoving at times in the dining room when people were getting food and this just made you want to leave and not bother. The entertainment was non-existant nothing for kids except for pool table and swimming. Couldn't wait to get home, never going again. The bathroom was clean and quite modern, no problems with hot water and the towels were changed every day which was very good. The reception and bar area were clean. Safety deposit box's for hire in reception area. The bedroom was dusty with very old fashioned tatty looking furniture. We had small ants in our room, but i tried not to let them bother me, they just ate the bits off the floor because the cleaner never swept or mopped the floor the whole seven days that we were there. The room did have three single beds in, even though there was only two of us. The unexpected benefit of air conditioning was great once we worked out how to use it. We were on the 4th floor overlooking the street and we had a nice view of the mountains and our balcony was huge and always had the sun. The rooms do get very cold during the night so you do need those blankets which are stored in the wardrobe. The food was quite boring,not much of a choice, chips,pasta or rice along with some meats and fish but no other choice of potatoes!! If we didn't eat out I ate chips and a bit of salad,(but admitidly I am a fussy eater). Soup was ok most nights!! Breakfast was worst - Only had eggs one day out of seven, couldn't even have toast because there was no toaster. Other days the breakfast consisted of fatty streaky bacon and beans, bread and bread rolls with greasy margarine. No problems getting sunbeds around the pool area there were plenty. Pool was fine apart from wobbly steps. Hotel staff were fine and friendly. Entertainment was nearly non existant, although there was a nightly disco under the hotel, it always sounded buzzing but when you got down there its empty. For kids - a few pool tables , a table football game , oh and yes they did have internet access which my daughter was gratefull for!! If it had not been for the great people we met there it would have been a really depressing holiday. we were ready for home. I would not choose to go back to this hotel, but dont forget it is only a 2*, I suppose you get what you pay for! !